As good as it looks. Photo: Alice Gao. We love all drinks but hold a special place in our heart for the Negroni. (It must be all those sunsets on the Amalfi Coast.) The world is getting in on the action this week. Suddenly seeing red? No need to call the optometrist: It's just Negroni Week, the seven-day spectacle taking place all over the globe from June 2-8, 2014. More than 1,000 bars and other drinky establishments are crafting their versions of the beloved classic cocktail and donating proceeds to charity. 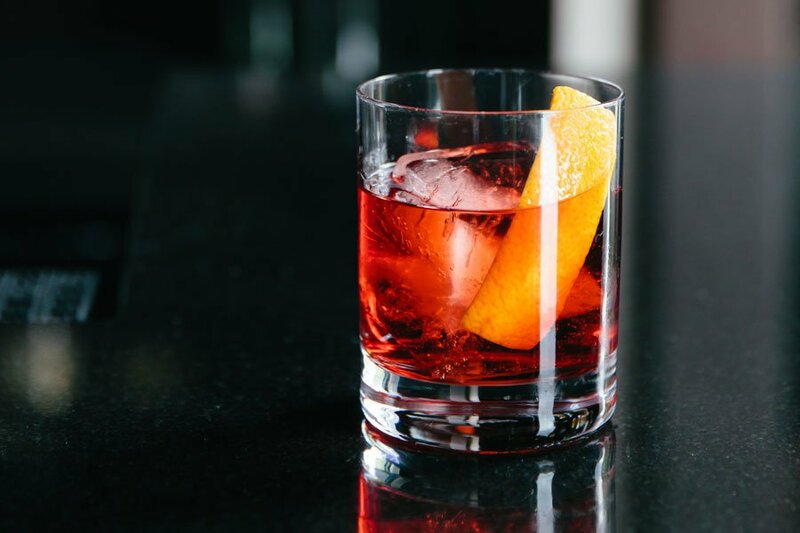 For the uninitiated, a Negroni is a mixed drink of Italian origin made from equal parts gin, red vermouth, and Campari, the distinctively bitter and citrusy ruby-tinted aperitif. "It takes time to appreciate — it's not a sweet, easy-going-down drink," says chef and James Beard Awards finalist Cathy Whims of Nostrana in Portland, Oregon. "It makes you think." Whims has done perhaps a little more meditation on the subject than most. Four years ago, she and then-bartender Doug Derrick created a Negroni of the Month special at Nostrana that resulted in 12 delicious variations. The collection prompted a party at the restaurant called the Negroni Social, which in turn inspired Imbibe magazine to launch Negroni Week nationwide. Now watering holes from New York City to New Zealand are whipping up their variations. Here are some of our favorites. Bartenders at Alden & Harlow in Cambridge, Massachusetts, are kegging the cocktail to benefit East End House. Analogue in Chicago made a variation called the Sloe Ride (Dolin Blanc, Campari, sloe gin, Peychaud's Bitters) for Girls Rock! Chicago. Chef Harold Dieterle's Manhattan restaurants, Perilla, Kin Shop, and The Marrow, will serve theirs with Bulldog Gin, Carpano Antica, and Campari, to benefit the Food Bank for New York City. Also in NYC, Ward III in Tribeca is sticking to the classic recipe and sister bar The Rum House in Midtown is making their Negroni Leoni with Santa Teresa 1796 Solera Rum, Ilegal Mezcal, sweet vermouth, and Campari for The Breast Cancer Research Foundation and Broadway Cares / Equity Fights AIDS. Chef Fabio Trabocchi's three restaurants are taking part for D.C. Central Kitchen. Fiola is serving Negroni Rosmarino (EG rosemary lavender vodka, Cocchi Americano, Dolin Blanc, and a rosemary sprig), Casa Luca has Negroni Primavera (Plymouth gin, Cocchi Rosa, Aperol), and just-opened Fiola Mare has NegroAmaro (gin, Amaro dell'Erborista, Cocchi Rosa, sweet vermouth). Cure in New Orleans, is serving "Madame Devalier" — Cocchi Americano Rosa Aperitivo, Ransom Old Gin, and Salers Gentiane stirred 40 times — to benefit Hogs for the Cause. BarChef, a Toronto bar we've covered and loved, is pouring Strawberry Negroni, with strawberry-infused gin, their own sweet vermouth-based strawberry and elderberry bitter, and Campari, to benefit Second Harvest. If you're not a drinker, you can try a snack inspired by the cocktail. Humphry Slocombe Ice Cream parlor in San Francisco is freezing Negroni Pops. Bouchon Beverly Hills is serving a special Negroni macaron. In Brooklyn, a vendor called Butter & Scotch will serve slices of Negroni Pie at the outdoor Smorgasburg food market on Saturday, June 7. "We are so proud to have inspired Negroni Week," says Whims, whose Negroni Social this year has grown to even include contortionists and performances by stilt walkers. "It's amazing that our love of the Negroni has turned into an international sensation that also raises money for charities." So what will she be drinking this week? "My overall favorite variation in summer is the Negroni Sbaglito, where gin is replaced with prosecco. It lowers the alcohol and gives it effervescence," she says.